Something that I have always wanted is a pergola. There is just something so gracious and relaxing about having a pergola in the yard. Now that I have the space in my backyard, I have been thinking seriously about adding one, and I thought that I would want to build it myself. So, that made me start looking for DIY pergola plans and I found so many! I put together a list of 20 DIY pergolas with free plans that you can build in a weekend or less. 10 DIY Zen gardens that I posted about earlier. If you have ever wanted your own pergola and you thought that having one built is just too expensive, you are going to love this list of DIY pergolas. You have 20 to choose from and all of them are beautiful and so easy to build yourself. Imagine having a relaxing pergola in the backyard in less than a weekend! And, you certainly want to check out these 15 budget friendly DIY garden ponds. You can make them in a weekend, too! If you really want something grand for the backyard, this 12 by 24 foot pergola is it. This is one of the easiest ones to DIY and it is absolutely gorgeous when it is finished. It’s a great way to use up some of those 2X4s that you may have left over from other projects, too. There are so many great DIY projects you can make from 2X4s and this is just one of them. 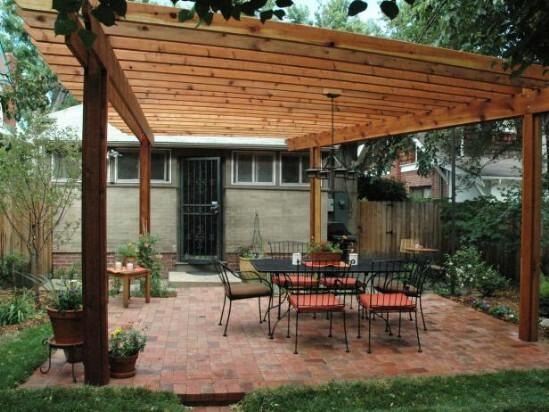 Believe it or not, you can have a pergola in your backyard in under an hour. This one just takes about 15 minutes! It’s pretty cheap and super easy to build. 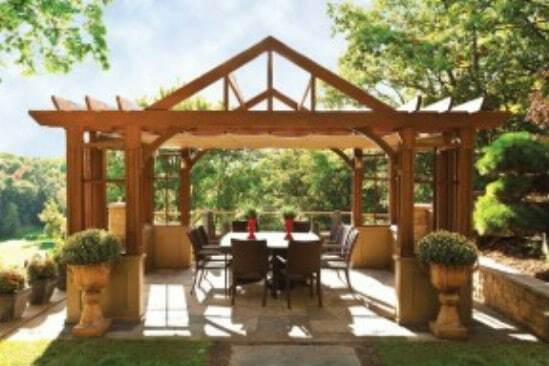 A pergola is a structure that doesn’t have a roof, so it’s a pretty easy build to begin with. This particular plan makes it super easy and it is gorgeous when it’s finished. This pergola is a bit smaller than some of the others but it is still fabulous and there are only four steps to building it. This is great for putting over your patio furniture or you could set it over a small flower garden or even use it as an entry into your backyard. The possibilities are endless and you are going to love how simple this one is to build. 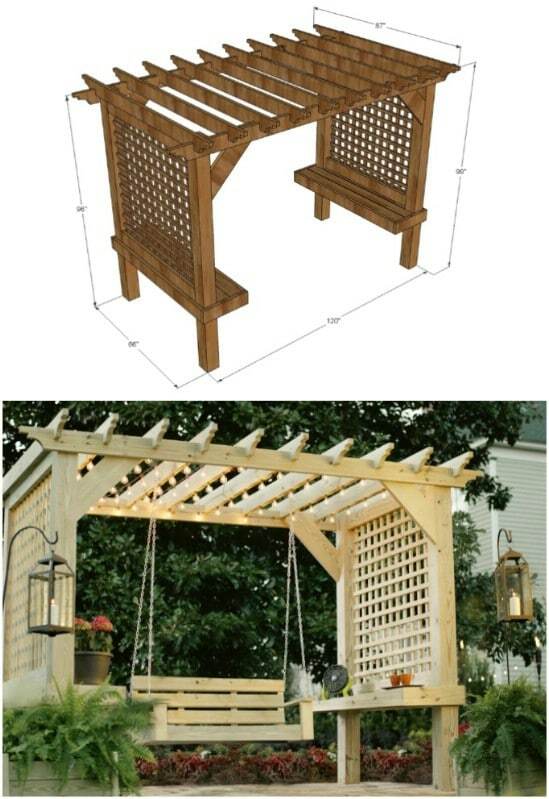 This easy to build pergola has tables built right in! This one is perfect for your outdoor entertaining and it is really simple to build. You don’t even need that much wood! You can have this one finished in less than a weekend and then just sit back and enjoy the beauty that you have created. And, did I mention that it has tables built in? 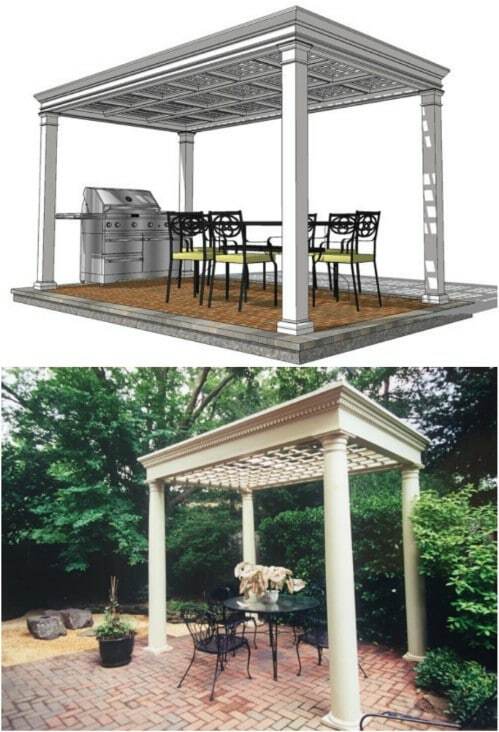 You create the tables while you are building the pergola – it’s all in the same plan. 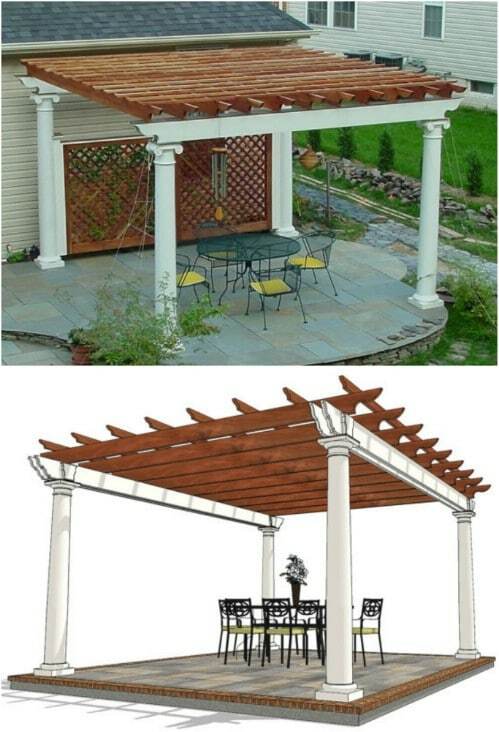 This pergola is really simple to build, even if you are not an experienced builder. You can build it to stand alone or even attach it right to the side of your house or on your deck. I love backyard decks that have pergolas on the ends. This one would be perfect for putting your barbecue equipment under or you could just have it out in the garden as a nice focal point. 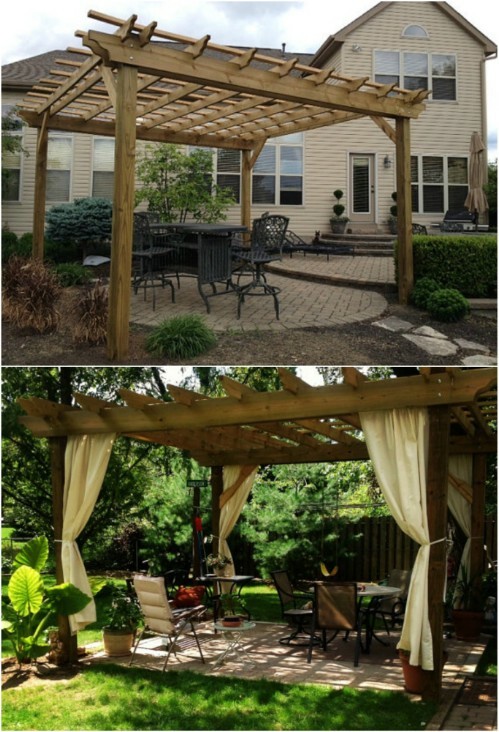 If you have a patio and you want to add a little something to it to dress it up, this DIY pergola is perfect. 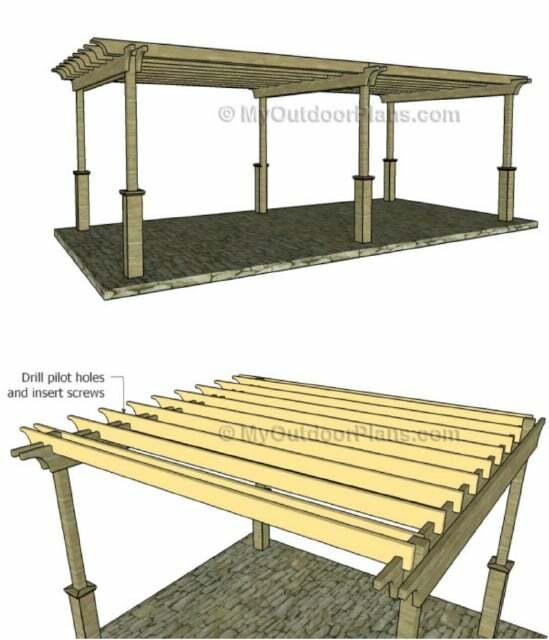 This one is really easy to build and you build it out from your house, so there is less lumber required than a pergola that is free standing. This is a wonderful way to add some beauty to your patio and you could hang curtains from it to help block out the sun on really hot days. Imaging having your own pergola that offers seating for all of your guests. This DIY pergola has beautiful built in seating and it is much easier to build than you may think. The design of this one is absolutely stunning and it seats so many people! 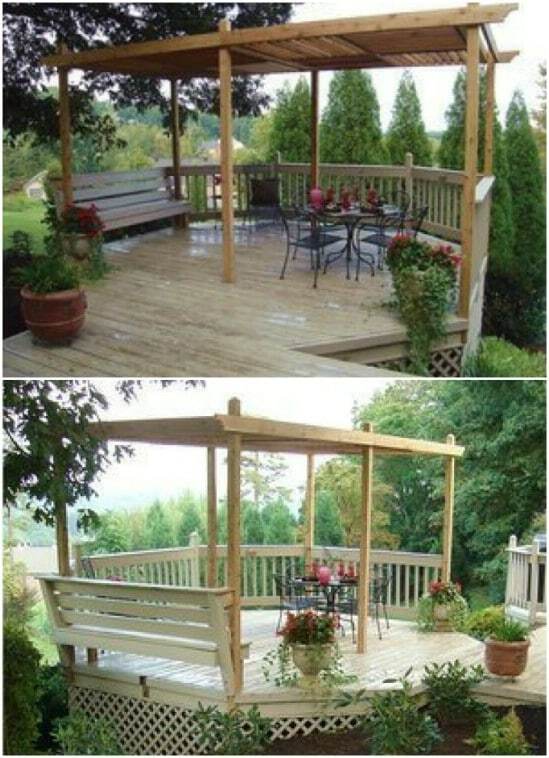 If you tend to entertain a lot during the summer, then this is definitely the DIY pergola that you want to check out. This is a wonderful way to add some DIY decorative benches to your garden this spring. 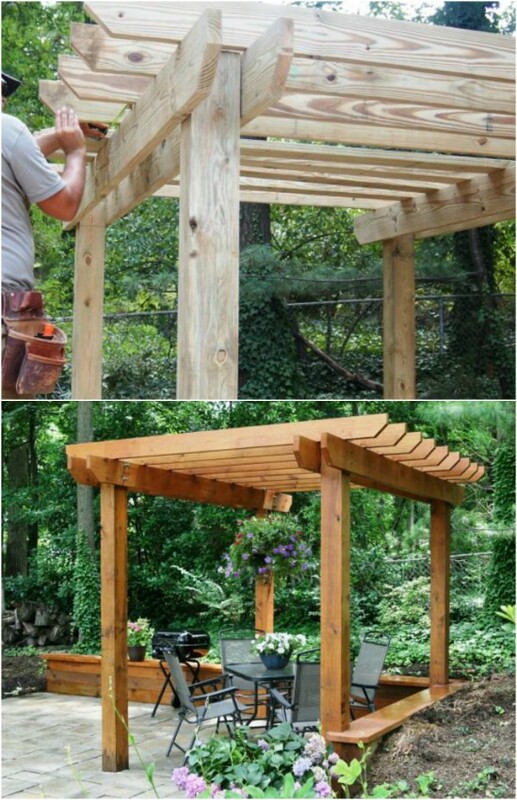 I love the design of this DIY Pergola. Not only is the pergola itself beautiful, but it also has planter boxes in each corner. You can add your favorite flowers to this one and make it even more beautiful. This is so perfect for the flower garden or anywhere in the yard that you want to add some décor. It’s a pretty easy DIY pergola to build, too. 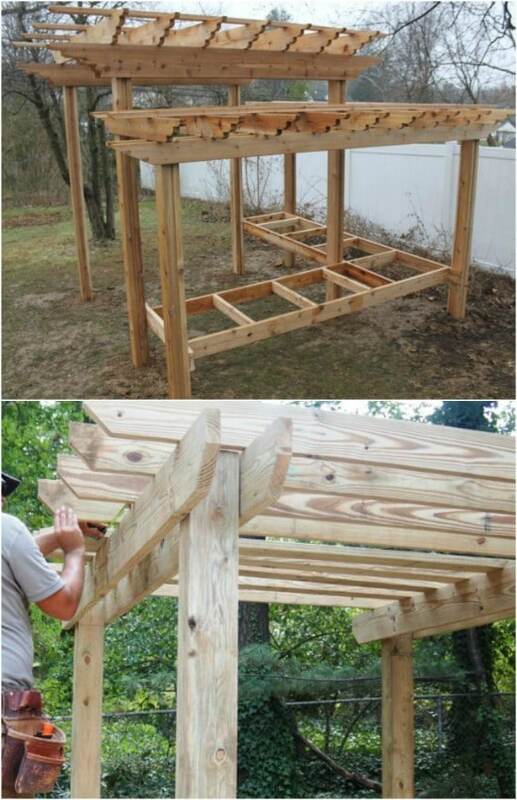 If you live in an area where hurricanes occur, you definitely want to take a look at this DIY free standing pergola. It is resistant to hurricane winds! Even those of us that don’t live where hurricanes happen could use this one. It’s really sturdy and so easy to build. You can use whatever type of wood that you like, although it will need to be pressure treated to withstand the weather. If you don’t necessarily want a regular sized pergola in the yard but you do love the look of these structures, consider this DIY mini pergola that fits right over your garage door. This is a great way to improve your curb appeal and it will instantly increase the value of your home. 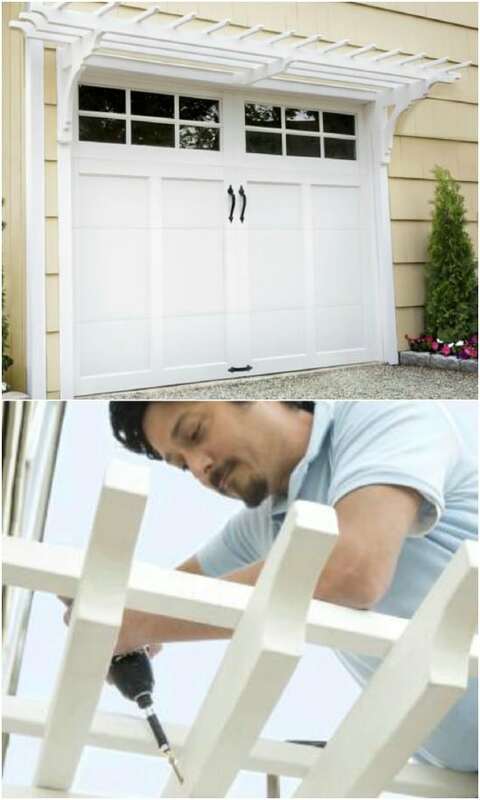 It’s a really simple one to build – you can have it finished in just one day – and it adds such beauty to the outside of your home. This pergola is a bit larger than traditional sized ones and it is fabulous. If you want room to add your outdoor kitchen and patio set, this is definitely the DIY pergola that you want to check out. It’s still a pretty simple build and you can still have this one finished in a weekend. It’s just so large and gorgeous and you can get so many people in it at once! It’s perfect for outdoor entertaining of large crowds. Having a pergola doesn’t mean that yours has to look like everyone else’s. This beautiful DIY pergola has louvered sides and it is so unique. 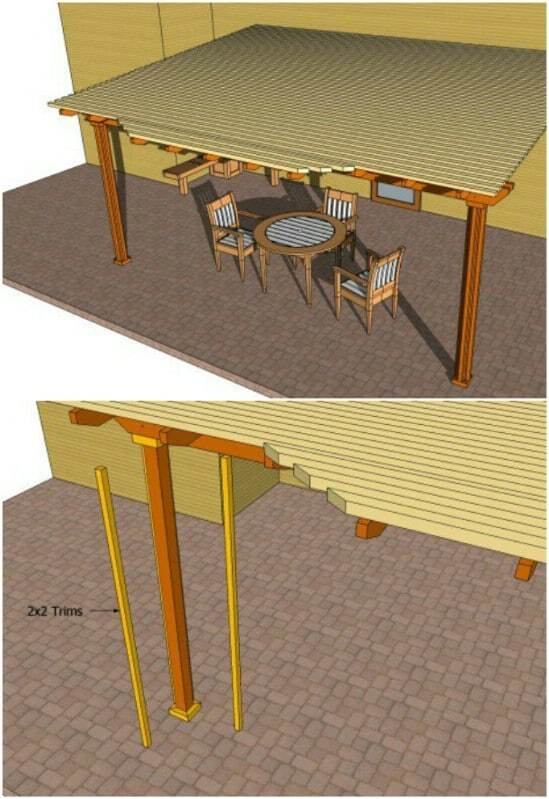 This one fits at the end of a deck but you could use the plan to create a free standing pergola if that is what you want. 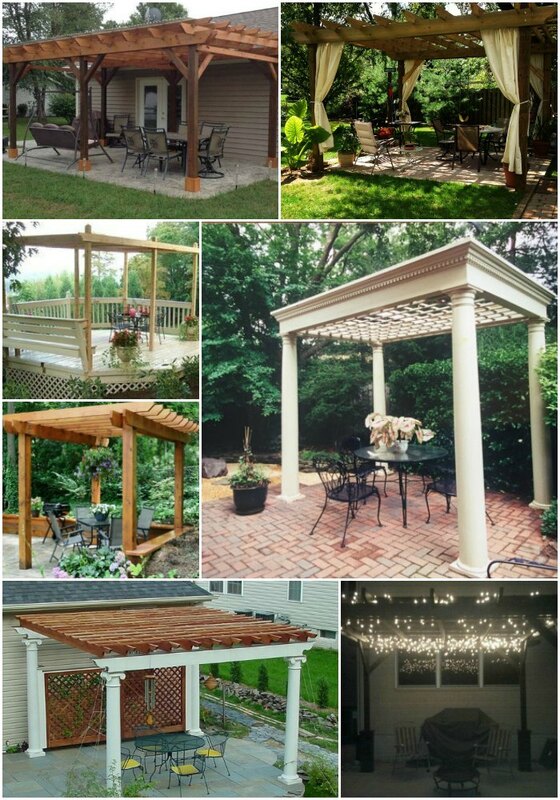 It is definitely not like all of the others, although it is just as easy to build as a traditional pergola. 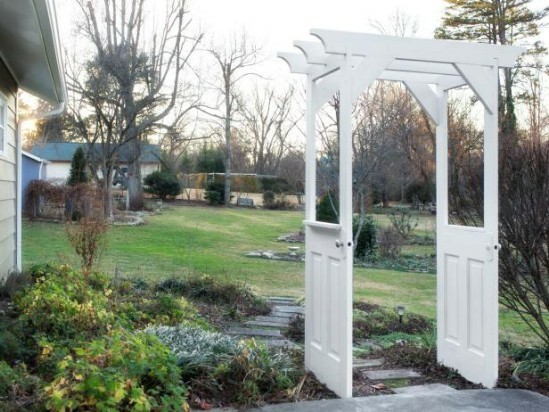 This gorgeous garden pergola is made from two old wooden doors and it is fabulous. You can definitely have this one built in a weekend. In fact, it shouldn’t take you more than just a couple of hours to have this one standing in your garden. It is perfect for creating a rustic looking entryway into your garden area or you could use it at the end of the walkway leading to your house. Add in some DIY garden stepping stones to make this one even more special. 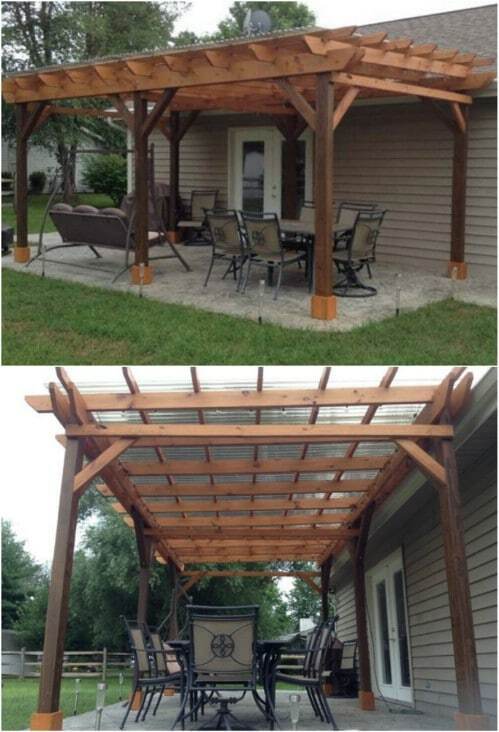 This DIY pergola not only attaches to your house for easy building, it offers you some shade. You can put this right there on the side of your house, or at the back door, and use it for your patio set. It has a roof so you are protected from too much sunlight and you can even sit outdoors in the summer during mild rains without worries of getting wet. I love this pergola that houses a porch type swing. The entire thing is a DIY project and it is so much easier to build than you may think. If you have ever wanted a swing in your flower garden, this is the perfect way to get one. Or, if you don’t have a porch large enough for a traditional porch swing, this pergola will give you the swing that you have always wanted. 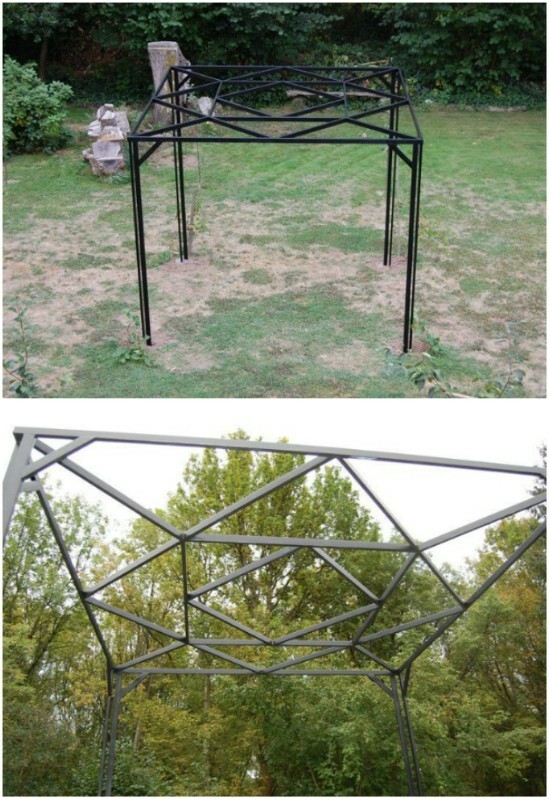 This DIY pergola has such a unique design. It is definitely not like anything you have ever seen before. The lovely A frame look gives it such character and it’s a really easy one to build, even with this great architectural feature. I love the double posts on the corners, too. They give it such an elegant look and you can even add some wooden planters if you want to really spruce this one up. If all you want is to simply add some décor to the outside of your home, this DIY miniature pergola is perfect. It will only take you a few hours to build and it really does add some elegance to your doorways. You can use this over sliding glass doors or French doors or make it shorter and use it over a traditionally sized door. This is a great one for adding some extra curb appeal and it will raise your property value, as well. Who says you have to have a traditional square pergola? This gorgeous round pergola is just as easy to build as a square one and it has a lovely unique shape that is sure to make your outdoors more beautiful. This has such an old world Greece look to it, don’t you think. And it is really lovely when you add some vining plants or flowers over the top and down the sides. You don’t really even need to go out and spend money buying wood to build your own DIY pergola. You can use branches from trees that are right there in your yard. This lovely DIY pergola has a gorgeous rustic look. I love rustic DIY projects that have a farmhouse look and feel and this is definitely one of those. And, it is so easy to build. If you just want a small pergola for your garden, maybe for your grapes to climb, then this DIY steel pergola is perfect. Not only is it a lovely structure to add to your outdoors, it helps those grapes to grow healthy and makes it much easier to get to them when it is time to pick them. You can build this one in less than a day and you could even make it larger if you wanted something to add to your front yard as lawn décor. I love pergolas! We’re working on redoing our yard this summer (our new fence just went in!) and a DIY pergola is definitely on the list. Thank you for all of the inspiration!